Pawn your Princess Cut Diamonds | Loans on Princess Cut Diamonds! If you’re a collector of precious stones you could be wondering ‘how can I pawn my princess cut diamonds in London?’ At New Bond Street Pawnbrokers, we take care of all the hard work for you. We’re a highly experienced and reputable team of experts, so you can trust us to value your gems accurately. We’ll always do our best to find you the highest price so that you can make the most of your loans on princess cut diamonds. To learn more or get started by booking an appointment, get in touch online or over the phone. Princess cut diamonds come second only to round brilliant in popularity. First created during the 1960s, it’s a relatively recent design that has four corners rather than rounded edges. 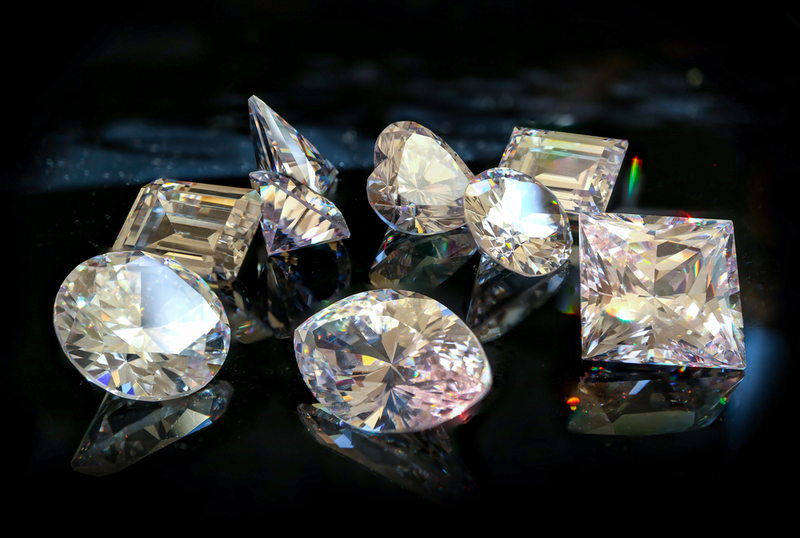 Princess cut diamonds can fetch slightly lower prices than their round brilliant counterparts, as about 80%, rather than 50%, of the rough diamond is retained. However, if you are thinking “I want to pawn my princess cut diamonds” you should be aware that ultimately it is the quality of the diamond that determines the final value of the stone. It’s also important to note that a princess cut does not refer to the grades associated with how diamonds are cut, which affects their value and quality. Both princess cut diamonds and round brilliants can sport an ideal, excellent, or poor cut. The pyramid-like shape of the princess cut as well as the four sides that are bevelled means that more light is dispersed than with other square shapes. The shape also conceals inclusions in the stone, making it appear clearer and purer. These stones are very popular choices to use on earrings and engagement rings due to them being easy to fit next to one another and their extra sparkly appearance. In 2014, a diamond ring with a princess cut centre stone sold at Sotheby’s for just over £32,000. What should I know before I pawn my princess cut diamonds? Carat: This is the weight of the diamond and heavier stones will often be worth more than smaller, lighter ones. Stones that are smaller than one carat can be purchased more affordable for less than £1000. Colour: Stones that boast a distinct colour such as blue, pink or green are rare and will be priced higher than ‘colourless’ gems. However, it’s equally rare for a stone to be completely colourless, and many that seem to be clear are actually varying shades of yellow or white. Truly colourless diamonds are expensive, as they allow a much greater quantity of light to pass through them. Cut: If a diamond has been cut well, it will reflect more light and will be higher in value. Classifications range from ideal to poor, with excellent, very good, and fair in between. Clarity: Lots of diamonds are flawed, whether that’s due to surface scratches and chips called blemishes, or because of impurities or air bubbles deeper in the stone, which are known as inclusions. The fewer imperfections your stone has, the higher the price and greater the clarity. Ready to secure loans on princess cut diamonds? If you consider to take loans on your princess cut diamonds, contact our professional team in London. You can get in touch online or over the phone, and we’ll offer you a prompt and professional response. Our service is free from unexpected costs, with a completely transparent paperwork process. For more information on services provided by New Bond Street Pawnbrokers please watch our video here and read about the loan process here.